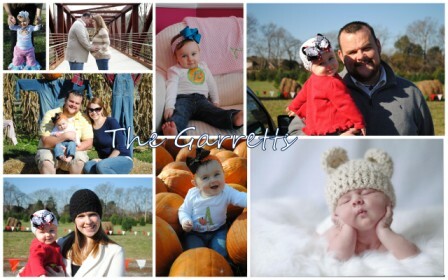 The Garretts: 15 Months Later.....We Have An 8 Month Old! Well, if you scroll back through my *long* list of blog entries, you will see how wonderfully successful I've been at blogging in the past. Impressive, right?! So, here I am, attempting to do it a bit more justice this time around. I've gone back and forth about blogging. 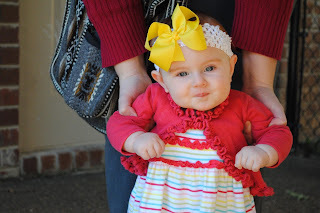 I wanted to blog through my pregnancy, so I could look back and recall moments from the experience. Unfortunately, life won, school started, and I never quite accomplished that goal. Hopefully, my superior memory won't fail me as I get older and try to remember Abi Kate's pregnancy ;) (And seriously, if you know me well, you know how "superior" my memory has become since giving birth...sheesh.) Over the last 8 months, Christ has done such a beautiful work in my heart. Truthfully, it began before our daughter arrived. He is sanctifying me through this journey of motherhood, and I want to remember the many things I've learned and to share them (because honestly, when have you EVER not known me to share an opinion, experience, or story....) And while everything He is teaching me has not been easy, it is a good work, and I am so grateful for His continued work in my life even when I fight and struggle against it. Lesson 1: Still totally in agreement with this statement. Show grace to the vomitting woman! Lesson 2: Yep, still in agreement. And it's funny that I mentioned people being sick their entire pregnancy because.... I was. However, it wasn't life shattering. So much so that I look forward to another pregnancy. Lesson 3: Nope. Wrong. 100% incorrect. There was nothing traumatic about Abi Kate's birth. It was gentle, intimate, and grace filled. I think most people have read her birth story. I'll tag it on here one day (I hope!). Lesson 4: This is still true. However, it's also true that I need to show much grace to the "Negative Nelly". And I am happy to report that we were blessed with an intervention free birth. He makes good on His promises. So, here's to a more faithful and fruitful effort of documentation of our experiences, as mundane or simplified as they may be! !